Wool felt is a very contemporary material, meeting the aesthetic and ecological expectations of architects and designers. Remarkably, it is also the oldest textile known to mankind. Few modern materials combine the multiple benefits of wool felt. It is an acoustic absorber, a thermal insulator and it is a rapidly renewable resource, as the sheeps´ hair grows back. 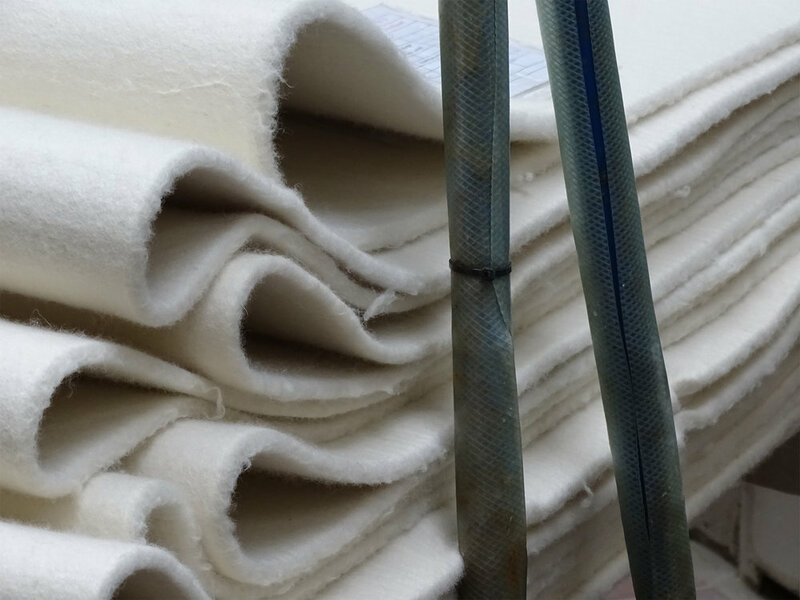 Felt does not fray, because it is not woven, it has very high tensile strength, it resists acids, it does not burn (it carbonizes as of 540°C/1,004°F) and it is hypo-allergenic. Wool felt is durable and biodegradable. Because felt is not woven, its thickness is not limited by yarn dimension. This allows very thick felt sheets to be produced, given designers more options in comparison to woven textiles. The Merino is one of the most historically relevant and economically influential breeds of sheep, much prized for its wool. The breed was originated and improved in Extremadura, in southwestern Spain, around the 12th century; it was instrumental in the economic development of 15th and 16th century Spain, which held a monopoly on its trade, and since the end of the 18th century it was further refined in New Zealand and Australia, giving rise to the modern Merino. In the wet felting process, hot water is applied to layers of animal hairs, while repeated agitation and compression causes the fibers to hook together or weave together into a single piece of fabric.